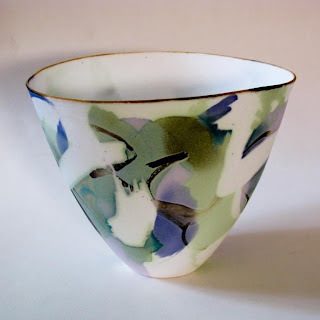 I have been busy with new body tests, I am exploring alternatives with the bone china I developed for my work. I find testing and research one of the most satisfying and rewarding aspects of my work. Also have got hold of additional soluble salts I am experimenting with. No results as yet but will post images of some new work as soon as I have. For now, here is an image of work made towards the end of last year. I have recently started a Facebook group called 'Ceramic Solutions' which is a forum for the discussion of faults and remedies and all things technical related to ceramics. If you haven't already done so let me invite you to join.